Ivor Hyde is now in ninety (2017). He was born on the Cricket Estate, where his father was head carpenter. He attended Winsham School. No School Buses in those days, so he had to walk both ways each school day. Ivor lived at Cricket St. Thomas until 1953, when he married his wife, Jean, and moved to Wadeford. Always a gifted musician, he joined Courtney's band in 1939, who organised dancing lessons in the old Flax Mill, and regular dances in the Jubilee Hall. Ivor played the melodeon and the small piano accordion, along side two of the Courtney sisters . Emma played the piano. Eva also played the C Major melodeon, as did George Pennecard, another member of the band. The music played was mainly 'Old Tyme' and some ballroom-quicksteps and foxtrots. War time was a very busy time for the young musician and he was often playing on Friday and Saturday evenings, at Winsham, Drimpton, Broadwindsor or Blackdown, and were held in aid of the war effort. The band played from 8.00pm to 1.00am, for which he was paid five shillings for each gig. Ten shillings a week would have been worthwhile money in those days. The band was transported in Ed Partridge' bus, along with supporters from Winsham. After the war, his participation in local dance bands, and when playing with the Diploma Dance Band. Often Tony Meech would play the piano at these events, and it was the start of a life long friendship. 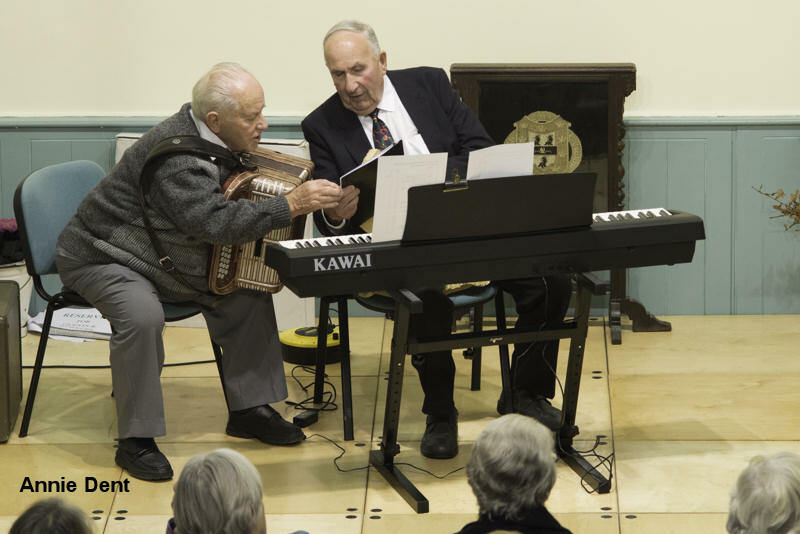 In 2014, Ivor and Tony delighted a full Jubilee Hall, as they led the audience in community singing, at the end of the Parish Councils 120th Anniversary party. The Diploma Dance Band was named after the butter produced at Wilts United Dairies at Chard Junction. In more recent years, Ivor has become well known in musical circles as an expert on all matters related to the Piano Accordion, and is often asked to retune accordions after repair or renovation. He now plays regularly for the Chard Folk Dance Club and busks for the RNLI fund-raising efforts.